Over the past couples years, many engaged couples have approached me because they are drawn to the photographs that integrate architecture and the couple themselves. And for this reason, I have always desired to find new locations within the Greater Seattle area to create more and unique architectural pictures. As I was looking for a new spot for Heidi & Alvaro's engagement session's take two, I came across this Helix Bridge on the internet, and it immediately caught my attention. If you search any top touristic landmarks in Seattle. This bridge would never comes up. However, it was designed by a family architect. It was like a hidden gem north of Westlake around an industrial area. You would only stop by if you happen to go to a local dry clean chain. I was really thrill check out the real deal, and this bridge did not disappoint when we arrived. We had so much fun just hanging out with Heidi and Alvaro who we became really good friends with. We also walked out to the waterfront to do some photos in front of a gigantic ship which ended up being a mischievous dispute between the couple regarding whether they should put that into the engagement album or not. In the end, I was so glad we made the trip to somewhere so close by with such an imposing viewpoint that has become a rare discovery by the locals. Location: Seattle, WA 98119 . 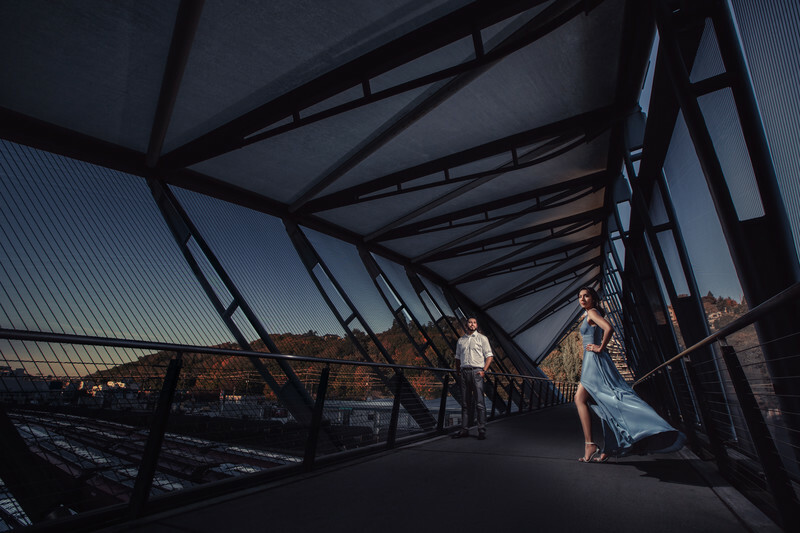 Keywords: archiecture photography (3), bridge (3), engagement photo (3), engagement session (6).